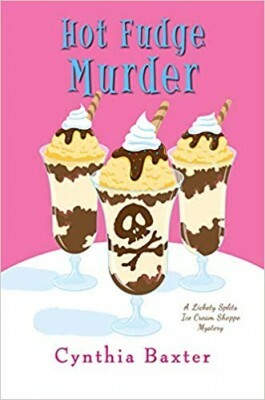 This week we have some more fun food mysteries for your Spring reading-Hot Fudge Murder: A Lickety Splits Ice Cream Shoppe Mystery by Cynthia Baxter, Restaurant Weeks Are Murder: A Poppy McAllister Mystery by Libby Klein, Drawn and Buttered: A Lobster Shack Mystery by Shari Randall, No Good Tea Goes Unpunished: A Seaside Café Mystery by Bree Baker. Details at the end of this post on how to enter to win a copy of all 4 books, along with links you can use to purchase them. If you have ad blocker on you won’t see the Amazon links at the end of each review. It’s only been six weeks since Kate McKay fulfilled her unrealized-until-now dream of opening the Lickety Splits Ice Cream Shoppe in Wolfert’s Roost, New York. A health scare from her grandmother led to Kate give up her job as a public relations agent in Manhattan, but Kate is more than thrilled to now be living with her Grams and niece Emma, who is searching for her own career path before deciding on college. Catering birthday parties and Chamber of Commerce meetings are a pathway towards Lickety Splits success, but the real boost to ensuring profits is the upcoming “life celebration” of the famous celebrity designer Omar DeVane. The sundae-loving fashion genius is hosting the event at his weekend retreat, and the Greenaway estate, that rivals Downton Abbey, will be filled with supermodels, entertainment icons, and fashion powerhouses. The pressure is certainly on for Kate and her two assistants, but she is confident that her superlative hot fudge sauce and custom flavors will please even the notoriously food-abstaining fashionistas. At least, that’s until Omar is found dead at the party by his housekeeper, strangled to death by his own tie. When business in Wolfert’s Roost nosedives as a result of the scandal and influx of tabloid media, Kate declares that she’s not about to sit on the sidelines and see her town decline. She’s already had a bit of experience in dealing with murder, and the one thing Kate has learned is that there’s nothing better than ice cream to forge bonds and coax out confessions. Though her indulgent treats – and then lighter sorbets when Kate finds her own pants tightening – Kate soon learns that Omar wasn’t always Omar, and despite his generous charities he also had his share of disgruntled business partners. Kate is going to have to be as keen with her observations as she is with her tasting palate if she is going to unravel the secrets hidden by those in the fashion world who have donned new identities along with their couture wardrobe. Readers will be as enraptured by Kate’s ice cream obsession as Kate is herself, with descriptions of her latest frozen confectionary making imaginations pop and mouths water. Kate is continually inundated with new ideas for her dessert creations, which are tantalizing blends of flavors, textures, and colors. Who could resist peanut butter and jelly ice cream, or sundaes made with whipped cream and warmed donuts? Just as intriguing are behind-the-scenes glimpses into the fashion world, as stylists clip and pin and models languidly pose into their best angles. Kate will be tempted by more than her just her Shoppe’s treats as two eligible bachelors vie for her attention, one the dairy farmer who broke her heart at prom and the other a neighboring extreme-sport business owner. Their competition for her heart is as enjoyable to observe as is their increasingly perplexing battles at Trivia Pursuit, but it is the former that will have readers coming back for more. Romance, mystery, and the celebration of all things ice cream make this a series to love leave readers hungering for more. Enjoy some treats of your own with these easy-to-follow recipes from Lickety Spilts: Heavenly Hot Fudge Sauce and Peach Basil Bliss Sorbet. Poppy McAllister has a B&B, something many people would envy. She enjoys it, sure, but her real dream is to be a professional pastry chef. When an opportunity comes her way, she says yes to working with her ex-fiancé Tim and his partner Gigi. Tim is very attentive to Poppy, when he can get away from Gigi, who has her sights set on him. Poppy’s flattered and there are all those good memories—on the other hand, she also has Gia, a hot Italian. He owns a coffee shop. Poppy supplies the gluten-free baked goods. The event is a cooking show, a small one, on the order of Chopped or Iron Chef America. A surprise to the contestants, especially Gigi who pictured Poppy as a go-fer, the chefs all cook at once, each having their own basket of secret ingredients. Catastrophe after catastrophe befall the contestants. Labels are incorrect on ingredients. The blender doesn’t work. An oven won’t heat. The sniping among the judges and between contestants is constant. To make things more challenging, the chefs are staying at the B&B. When one of the judges is found dead, the chefs are all suspects. The problem is, who had opportunity and means? There were a lot of motives! The mystery will keep readers guessing until the end while the recipes will have them drooling. Poppy is a wonderful character, unable to decide about the men in her life but sure about her baking skills. Poppy’s Aunt Ginny is unbelievable in her outfits, taking bets on the winner of the contest, and bringing her cohorts to be in the audience with her. She has no qualms about doing whatever, whenever, and that makes the book even more enjoyable. This is the third book in the series (all reviewed here). Just when you think you know what’s going on, you’ll find out you were wrong. For a glimpse of behind-the-scenes action at a cooking competition, with a cup of jealousy and a hint of romance thrown in, this is the right book for you. Recipes for Paleo Black Forest French Toast, Paleo Chocolate Chunk Loaf, Lemon Crème Brûlée, Gluten-Free Lavender Shortbread, No-Bake Passion Fruit Chili Cheesecake, Paleo Earl Grey Madeleines, Dark Chocolate Pots de Crème, Paleo Biscuits, and Aunt Ginny’s Fig Jam are included in the book. When you’re a ballerina, you don’t make much money. When you’re an injured ballerina, you don’t make any money. 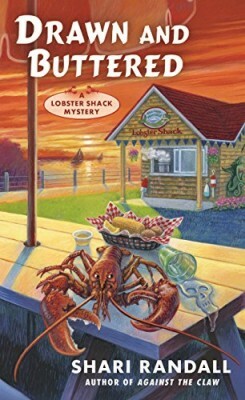 That’s why Allie Larkin is working for her aunt at the Lazy Mermaid Lobster Shack while her ankle recovers. You can get a dynamite lobster roll or bowl of chowder there, and, if you were lucky, you’d have been there the day Lobzilla arrived. Lobzilla (lobster + Godzilla) is a three-foot long, twenty-seven pound, elderly lobster. He’s destined to go to the college to live out his retirement years. People are missing or ignoring the irony of eating lobster rolls after taking selfies with Lobzilla. When Lobzilla is lob-napped (lobster + kidnapped), there’s an uproar. If the lobster isn’t in salt water, he could quickly die. So, was it a college prank or was Lobzilla destined for The Big Pot of Water Death? Maybe not everyone would realize a lobster that old would not be good eating but then, who has a pot big enough? Then there’s the dead body in the cemetery. Of course, you’d expect to find a dead body in a cemetery, but this one is very recently dead—like within hours. On the face of it, no one has a motive, means or opportunity—or do they? Allie will find out. This is the third book in the series. Allie is a sensible woman, given to flights of fantasy only when on stage and on pointe. Aunt Gully and her Girls, the ladies who help out as needed, are an example of growing older but not old. Add in a witch’s coven, a ghost who might also be a vampire, mysterious leis on the mermaid’s figurehead, a Peeping Tom, hidden cameras, and a choking customer. Life in a small coastal town is anything but boring. Although things are changing for Allie, this is a series I want to go on for a long time, and not just in hopes that Aunt Gully will share recipes in books to come. Everly Swan left her hometown to follow the rodeo circuit with a cowboy. When it was her turn to go to culinary school and him to follow her dream, he rode off into the sunset, leaving her broken-hearted and headed for home. Once back in town, she’s able to buy a house she’d long coveted and convert it into an iced tea and sandwich shop plus rooms to rent upstairs. She’s hosting a wedding for her old friend Judy who’s marrying Craig, a tech billionaire. Things are going smoothly until just after the vows when Craig’s old girlfriend shows up in an attempt to stop the wedding. For better or worse, she’s too late. 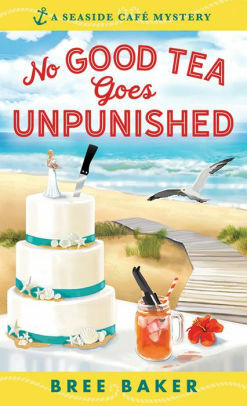 When it’s time for the photos, the groom can’t be found—until Everly discovers his body floating in the ocean. CPR is no help, and the bride is a widow before the honeymoon even starts. The police ask guests to remain in town until the autopsy is done and the killer is found. The suspect list includes an owner of a company Craig was investigating, his business partner Pete, Judy for the money she’ll inherit, Judy’s old flame who’s suddenly on hand, a nosy reporter in search of a scoop, and more. Everly helped solve a murder a few months ago and feels she’s invested in this one too since she found the body and Judy is her friend. Threats turn up at the tea shop and on the beach. When a second person is struck down, she knows the killer is desperate. This is the second in the series (Live and Let Chai was first). Everly’s aunts are not typical older women. In this case, they’re on a mission to save the bees. There’s also talk of running for political office. Everly’s best friend, Amelia, owns the local book store and maintains the Little Libraries where readers can take a book/leave a book. The police detective Grady is a widower, a definite catch, with a small son. Watch for sparks to fly between Everly and the cop. At the back of the book, Everly shares the recipe for Blushing Bride Tea Blend (there are hibiscus leaves in it), Pineapple Chicken Wraps, and Sweet Tea with Jasmine. For a seaside vacation, make yourself a glass of tea, sit back, and enjoy Everly’s escapades. To enter to win a copy of all 4 books, simply email KRL at krlcontests@gmail[dot]com by replacing the [dot] with a period, and with the subject line “spring food,” or comment on this article. A winner will be chosen March 30, 2019. U.S. residents only. If entering via email please include your mailing address (so if you win we can get the book sent right out to you), and if via comment please include your email address. You can read our privacy statement here if you like. Spring Food: What a wonderful giveaway. Thank you for the chance. 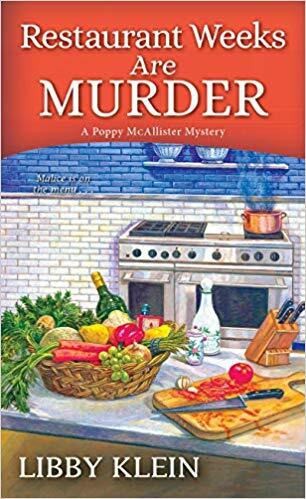 As an avid mystery reader, I’m always looking for new books and authors, especially ones that talk about food and have recipes. Four books! What a deal! These are all great books! Thank you for the opportunity! Great Spring reads. Looking forward to reading all of them. Thanks for the chance. Thank you so very much for the Chance to win!! All these books look so very good!! I’ve read a couple of the ones mentioned above and loved them. Thanks for putting them on your blog. Fantastic love to read every one of them.